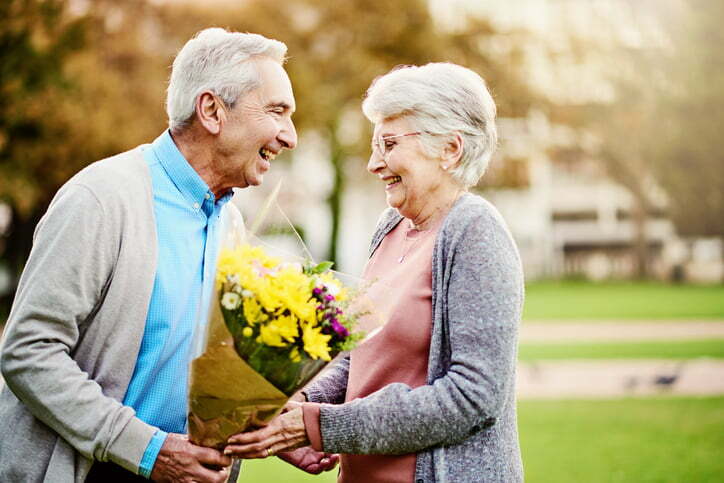 Great ideas for the elderly loved ones in your life on Valentine’s Day. There is perhaps no more fulfilling and worthwhile way to celebrate Valentine’s Day than by spending it with an elderly loved one in your life. Call to your loved one’s home with their favourite flowers. You can include a handwritten message that tells them all the things you admire most about them. Searching for elderly care? Find care in your area now. If the person you are visiting has a sweet tooth consider baking (or buying) their favourite dessert. You can share a piece together when you visit and are reminiscing over fond memories. If you have any pictures of you and your elderly loved one, framing one and bringing it to them as a Valentine’s gift is a great idea. You can bond over your shared memories from when the photo was taken and leave a lovely present when you go. Sometimes there is no greater gift than sitting and having a chat. If your loved one has lost a partner, reminiscing about their love on Valentine’s Day might be just what they need. Find out what their favourite old romantic movie is and watch it together. Who wouldn’t love to spend Valentine’s Day watching Casablanca! Stay active this Valentine’s Day and go for a leisurely stroll together in a nearby park or any scenic nature spots. Why not make a bit of a party out of it? Invite some neighbours, friends or family over and have an evening of socialising with your elderly loved one. Read Next: At Home Guide for Elderly Care: Are Your Parents Able to Live at Home?